Description: Dark brown, to 2 m in length; with a claw-like holdfast, a smooth, flexible stipe, and a laminate blade to 1.5 m long split into finger-like segments. 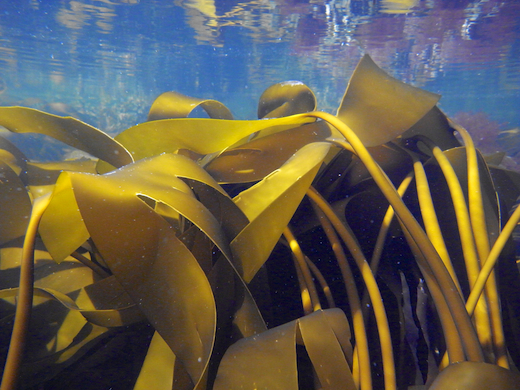 Distinguishing features: The stipe is oval in crossection, and does not snap easily when bent; in Laminaria hyperborea the plants are lighter in colour, the stipe is generally longer, thicker, circular in crossection, and snaps easily when bent, and the holdfast is conical. 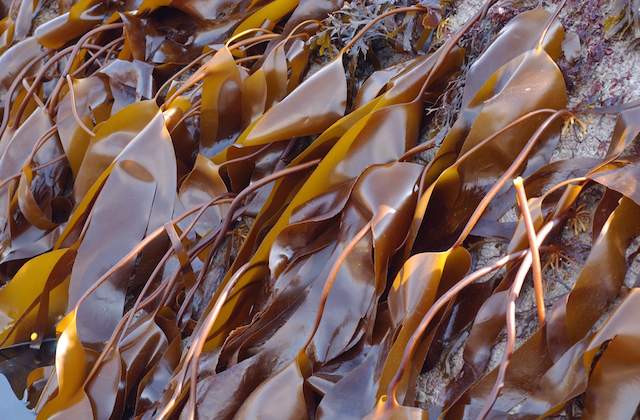 In Saccharina latissima (formerly Laminaria saccharina) the blade is undivided and has regular, small depressions known as bullations. 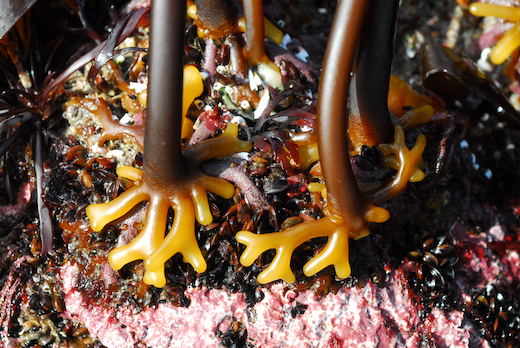 Habitat: very common in the lower intertidal and shallow subtidal growing on rock in Britain and Ireland. 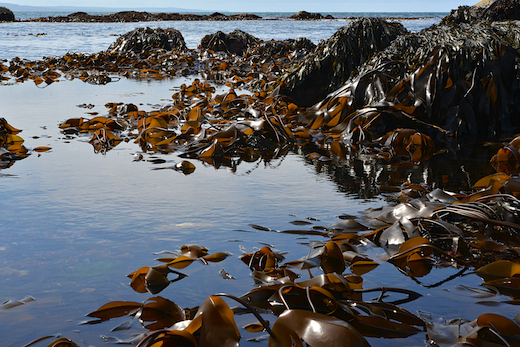 May form extensive meadows at low water (top picture from Robin Hood's Bay, Yorkshire). 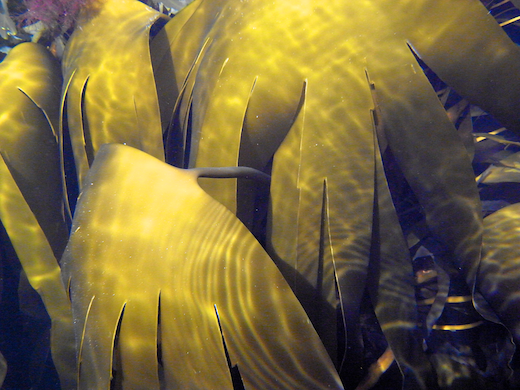 Underwater plants are more golden in colour in sunlight. Distribution: Common on all coasts of Britain and Ireland except for the east and south-east coast of England from Yorkshire to the N coast of Kent; otherwise distributed from Svalbard, Iceland and northern Russia south to Brittany. In the western Atlantic from the NE coast of Greenland south to Cape Cod and, although less common, to Long Island. Not known elsewhere. 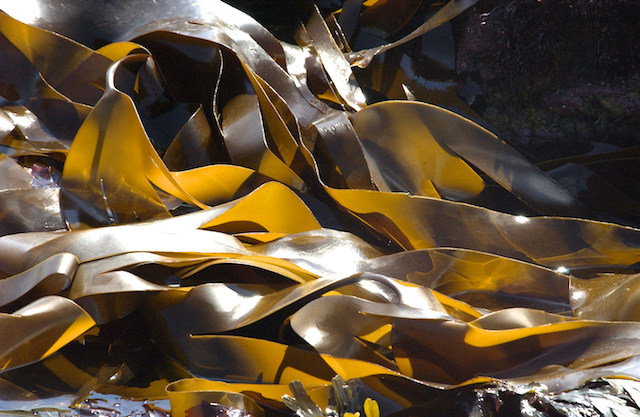 Usage: Harvested in France (Brittany) for alginate production; and in Ireland and France in small quantitites for sea-vegetable production. Site © M.D. Guiry 2000 - 2019. Important copyright notice: all text, design and photographs on this site are copyrighted by M.D. Guiry unless otherwise stated and all rights are strictly reserved. Click here for copyright information and contact. Website design: 249 Design Studio. Site maintained by M.D. Guiry (michael.guiry@nuigalway.ie). There have been 8724602 page loads since 1 January 2014 on 22 April 2019.